Then I tackled the more difficult tasks. I selected two cups from the cabinet above the coffee maker. Good planning. I had to open the refrigerator to find and remove the milk. I cleverly poured milk into each cup, just the correct amount. Then, because we like to mask the taste of actual coffee, I needed to find the sugar. I did not find it immediately. Sometimes Miss Sugar keeps food items in cabinets, which is very inconvenient for me because I must either remember which cabinet or go exploring. Nope, it wasn’t where the plates are. It wasn’t in the silverware drawer, but I was glad to be reminded where she keeps silverware. It wasn’t by the cereal boxes (which I think would be an excellent place). Where did that woman put the sugar? At last, I found a container of liquid labeled sugar concentrate. Aha! That seemed better than sugar granuals from a sugar bowl or bag of sugar. Maybe I could get by without a spoon, although I now knew where the spoons could be found. So I poured sugar concentrate into each cup and covered the milk and sugar concentrate with coffee. I figured it would all mix together as I walked upstairs to the bedroom, where I would surprise Sleeping Beauty. My grateful wife thanked me for the delicious concoction that I had delivered. We sat in bed savoring the sweet beverage. Miss Sugar jokingly inquired, “Why does this taste funny?” What a card! I took it as a compliment. “I couldn’t find the sugar bowl but I found the bottle of sugar concentrate,” I explained with pride. I felt all fluttery inside. We had a very productive day! It says “Just Add Water” on the bag above, but coffee works too. 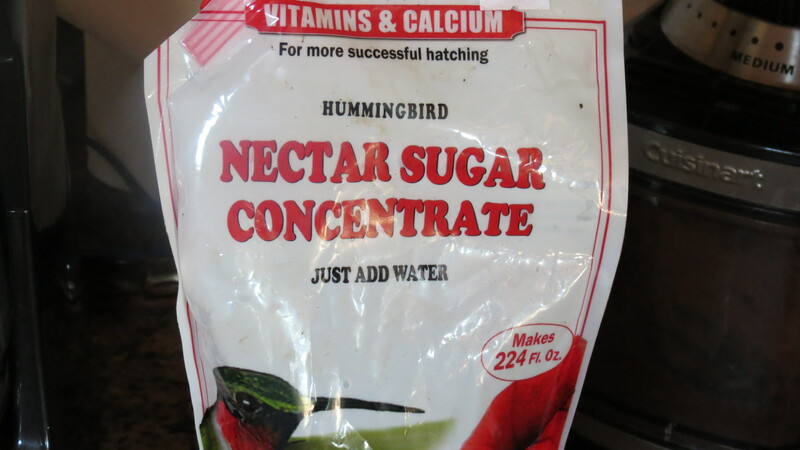 We also have hummingbird nectar! Alan, I feel certain that Miss Sugar realizes what a gem you are! Thanks, Jeannie, for commenting. I am glad you enjoyed the true story.